There is so much to love about this book for middle grade readers. Have fun! The end of 8th grade is just around the corner and the summer between all that is known and all that is unknown (high school) is just about to begin for Lucy, Michael and Elena. The final reveal of 8th grade is the summer reading list. There are seven titles ranging from David Copperfield to Fahrenheit 451 to Enders Game to To Kill a Mockingbird. What’s striking about this list, is not that the books are tedious or unreadable – in fact Lucy, Michael, and Elena have already read most of them. It’s the length. 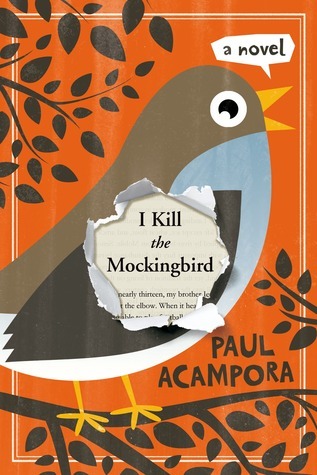 At the beginning of 8th grade their English teacher, Mr. Nowak, had announced that the only book for summer reading would be To Kill a Mockingbird. He said that he hoped by then they’d all “be good enough readers to appreciate it.” Mr. Nowak defined a good reader as someone who “starts to see what an entire book is trying to say. And then a good reader will have something to say in return. If you’re reading well, you’re having a conversation.” That definition stuck with Lucy – she was already a good reader, wasn’t she, but what about the conversation? These three love reading and great writing and they want books to matter. They know they’re weird and they’re okay with that. Still books should be read. They devise a plan so they can “speak for the books” and get a conversation going – a conversation that Mr. Nowak would be excited to be part of. Thus, ikillthemockingbird.com is created. It starts slowly at first, but suddenly books become a topic of discussion way beyond West Glover, Connecticut. The I Kill the Mockingbird campaign crosses the country. How do you stop something once it has taken on a life of its own? How will it end? Read I Kill the Mockingbird as a lover of reading AND a lover of life. Enjoy it funny twists and turns. Life and reading is always better with true friends, understanding family and great books. This one gets added to the list.